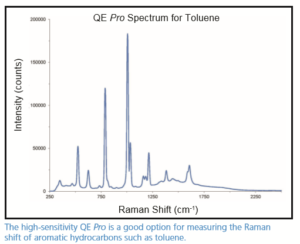 The QEPRO is the most sensitive spectrometer ocean optics has ever developed. This scientific grade spectrometer is especially well suited for low light level and advanced measurements, such as absorption, reflectance, Raman spectroscopy and fluorescence. A 15,000 spectra buffer ensures data integrity at high collection rates and an advanced optical design and thermoelectric cooler combine to provide thermal stability over long-term measurements. Whether for high speed or wide concentration range measurements, the QE Pro brings exceptional performance to your lab or process application. Buffering enables full-Spectrum kinetics measurements to be performed every 8 milliseconds or 125 measurements per second.